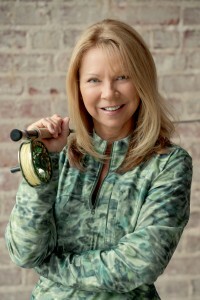 Wanda Taylor is an exceptional casting instructor – able to reach back to her own learning and hasten others’ learning. A tough thing to do. In what capacity are you currently engaged in the sport of fly fishing? and I’m the first woman ever to become a Master Certified Casting Instructor by the International Federation of Fly Fishers and I’m the owner of Wanda Taylor’s Fly Fishing/Casting School. WHT: I married a professional fly fishing guide, Capt. Gary Taylor. He and the staff of Dry Flyer Outfitters were my classroom until I met Joan Wulff and then, Lefty Kreh. What is it about fly fishing that “keeps you coming back”? WHT: I’ve loved to fish since I could walk. Perfecting the cast and presentation to each fish is something I truly enjoy, as well as, discovering “what” fly the fish want and “how” they want it presented to them at any given venue. Fly Fishing Schoo sponsored by Saltwater Fly Tyers with Wanda Taylor at The Fish Camp in St. Augustine, Florida last spring . Who were your biggest influences or mentors, male or female? WHT: Joan Wulff and Lefty Kreh, and both still are. What would you consider your home fishery and what do you find so alluring and special about it? WHT: I have two. The Hiwassee River in Reliance, Tennessee and Port St. Joe on Florida’s Gulf Coast and Bay area. The Hiwassee River is a big brawling tailwater river controlled by the Tennessee Valley Authority. It’s located in the Cherokee National Forest with lots of access to its waters, one of which is the John Muir trail along its Big Bend area. It’s a year round fishery and incredibly beautiful in each season of spring, summer, fall and winter. Its possible in the summer to wade fish in the morning and float a water craft and fish in the afternoon. The Hiwassee is a put and take fishery with rainbows and browns. The river gorge is home to eagles, osprey, heron and kingfisher. A photographers paradise with wild flowers and breath taking sunsets. I know the river intimately. I have fished it for many years alone. Some of the best fly anglers in the southeastern united states are as smitten of as I am. I love saltwater fly fishing. The smell of salt air, shore birds, paddling with porpoise, wade fishing for seatrout, redfish, spanish or blues are just part of the allure of the town flats of Port St. Joe, Florida. Within minutes, the option of bay fishing in kayaks or surf fishing the Gulf of Mexico makes it special. What’s not to love about Cape San Blas in St. Joe Peninsula State Park. Voted one of the top three most beautiful beaches in America – cruising tarpon, kings, pompano, sharks and ladyfish; it’s a saltwater fly anglers paradise. A Healing Waters event. Taylor photo. What environmental challenges are faced by your fishery? WHT: The same that most rivers and oceans have around the world – human greed and our being negligent in taking proper care to keep clean waters. When you are not fishing, what are you doing? WHT: Teaching or lecturing about fly fishing at fly fishing shows and fly clubs nation-wide. Normal everyday living of eat, work, sleep, fish and repeat. I love hanging out with my family and friends. You have the day off. What are you fishing for and where? If I’m home in St. Joe – any moving saltwater species that is there at the time. What charitable organizations or causes do you support? Why is this important to you? Georgia Women Fly Fishers “Casting For Confidence,” a Free Fly Fishing Retreat for breast cancer survivors. North Carolina and South Carolina’s “Casting Carolinas,” Free Fly Fishing Retreats for women with all types of cancer. 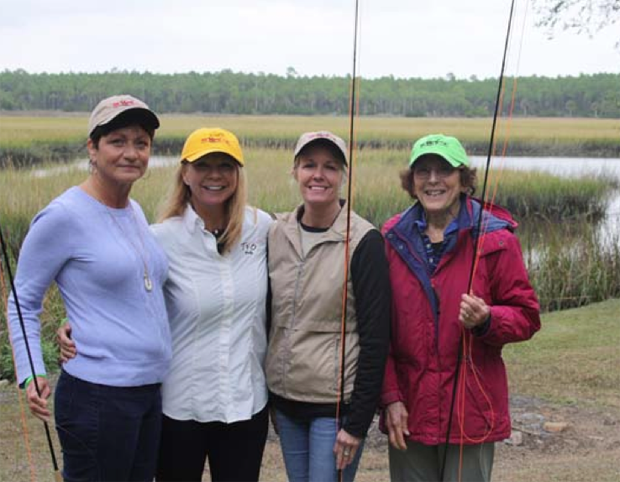 “Casting For Recovery” is a free fly fishing retreat for women with breast cancer. Why these retreats are important to me? I hate cancer and all it puts humans through fighting it to stay alive and hopefully beating it. These retreats are a reprieve from every day dealing with cancer and give the mind and body a mini vacation and rest. It’s impossible to catch a fish on a fly and think about cancer at the same time. Normally Joy, laughter and jubilant high fives occur. That’s why these non profit orgs are important to me. Project Healing Waters – teaching our vets to tie flies, build rods, fly cast and fly fish for free. I feel we as Americans need to give back to those who put their lives on the line every day to protect us and keep us free. It’s an honor to work with these women and men that are true heros. 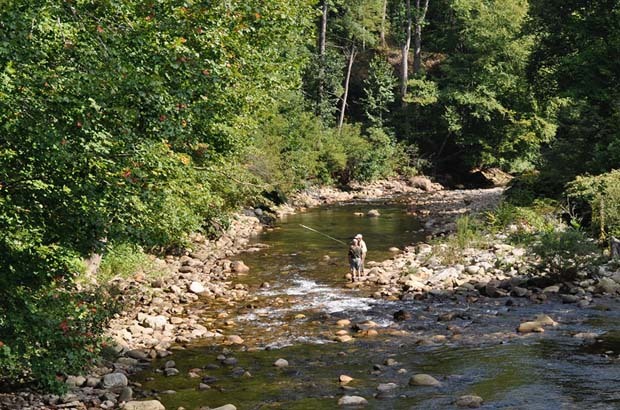 Where would you go to fish if there were zero restrictions on expense, travel, etc…? Why? WHT: I would go to EVERY (350+) islands and cays in the Bahamas on a Mothership with a small flats boat on board and sea kayaks. Why? I love bonefish, tarpon and permit.